Excellent show, guys! Time Travel Week’s the new Shark Week. Per the Timey-Wimey-Conundra in the Angels Take Manhattan. SPOILERS follow. It’s poorly described in the episode, but Jay’s reading is more or less the reading I took away and the one I’m seeing people taking away around the Internet. Basically, the initial “jumping off the roof” erases the Hotel-Farm-Thing, but then the lone Angel at the end takes Rory as “punishment” for killing all those other Angels. 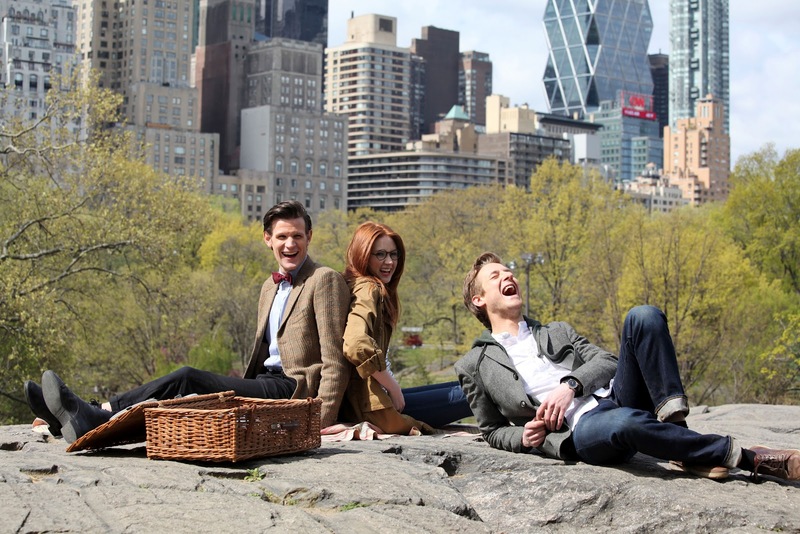 Rory and Amy are living “sometime” in the past. Presumably, based on clues we have, at some point they synch up with young Melody in Florida, with those pictures of an Older Amy in that orphanage, or with the Post-Regen Melody in 1969 New York. I think you’re onto something when you point out that there’s some sort of Long Game going on with Moffat and New York. I think, in a way, thought it may have ended up being bloated, Angels seems like a two-parter hastily shrunken down to one and there’re a lot of hangovers of cool ideas, like the Statue of Liberty, that don’t mesh back into the leaner story. As for me, I’m a big fan of River’s character, but I understand the reticence to having her around so much. I felt like this was the strongest that Kingston and Smith played off each other, and the “couples” dynamic of Manhattan was pretty neat. I like the conceit of River, and I like that she wasn’t just a one off and never mentioned again, but rather pops up. Though perhaps too often. Over all, I enjoyed 7.1, I think you have 5 rather evenly balanced episodes, though the plots tended to be paper thin, I think we ended up in great places with the characters. This is one of the few times where a companion has a character arc that’s fully realized, I think under Davies we end up with some rather uneven arcs. You are currently reading ft podcast episode: doctor who 7.1 at Fuzzy Typewriter.